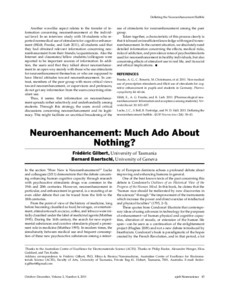 eCite - Neuroenhancement: much ado about nothing? Neuroenhancement: much ado about nothing? In the section "How New is Neuroenhancement?" Lucke and colleagues (2011) demonstrate that the debate concerning enhancing human cognitive capacity through research with psychoactive stimulants drugs was common in the 19th and 20th centuries. However, neuroenhancement in particular, and enhancement in general, is a recasting of an even older debate that can be traced from the 16th to the 18th centuries.